A note on cleaning cranberries. Fill a sink or large bowl with cold water and your cranberries. Swirl them around and scoop them up with your fingers. You will easily find any mushy berries. Throw them out. You don’t want mushy berries. Or you could compost them for your garden next year. Just don’t put them in your yummy cranberry sauce :) Also, I have not tried making any jelly yet with sucanat so I’m not sure how it would come out with this versus organic sugar. If you use it, please reply and let me know. Happy Turkey Day! I made cranberry sauce today. It is so easy! I actually make it both ways because a couple of my guys like it chunky and a couple prefer the jelled. Cranberry skins have so much pectin in them naturally that after I cook them on the stove for the 10 minutes I just blend up in my Blentec (any blender would do) and pour into mason jars. Then you can water bath can them or just chill for a couple hours in the fridge. Slides right out of the jar and can be sliced or otherwise enjoyed just like the cans from the store but so much better. ???? Not sure where the question marks came from. I didn’t add those. Lol I actually had a smiley face there. I had no idea you could can this with a simple water bath. Oh man. This will be fun! We like to sweeten our cranberry sauce with maple syrup. I also add an orange rind and all that I chop up in a food processor. So easy and so much better than store bought! Great idea to do that in a food processor to make it smooth. So yum! You can cook it with some orange rind for some extra yummyness! Hey Laura, I am from Kenya and a regular follower of your blog. yThough I can’t prepare some of the recipes because we don’t have the ingredients here (like these canberries), I still love reading your blog coz of how fun, simple and humourous they are. If I was to host just one new guest before the year ends, I’d choose you. Love you! I read you can freeze it so here goes! I didn’t know that. I’ll have to try it! Regarding the biscuits in a can–I am scared of them, too. I make my kids open them. Yes, yes I do! Even if they are outside playing, I’ll call one in or take the can to him/ her to crack it open….far, far away from me(because it makes me scream). Thanks! It is cool how the cranberry sauce comes out shaped like the can. For several years, my family would ask, “who is bringing the traditional cranberry sauce that’s shaped like the can?”. After a while, we just called it canberry sauce! Ha! Canberry sauce. I love it. I’ve made the homemade kind for years but our table also included the canned kind for my Grampa. He passed in January so this will be the first year we don’t plop any out of a can. I won’t miss the processed-ness, but Thanksgiving won’t be the same without that suction-y sound – – and don’t forget trying to catch it before it plop-slides right out of the dish and onto the floor. Thankfully, with the can shape, we could just pick the whole thing up off the floor, run it under the faucet and set it back into the dish, with Grampa none the wiser. I started making homemade cranberry sauce several years ago. To neutralize some of acidity, which is the reason your face puckers, add a 1/4 tsp of baking soda. (You may need to adjust this up or down depending on the tartness of your berries. It will cause your sauce to foam a bit, but you’ll be able to cut the sugar in half with no difference in taste. This trick works with tomato-based dishes as well. We make it homemade as well, but have to include the canned variety for my Dad! I can just hear it . . . SHHHLLLLOOOOP! LOL! We make a Holiday Cranberry Conserve which is just basically cranberries, sweetener, onions, raisins, apple juice and toasted pecans. We have made this every year for 15 years. :) It smells like the holidays while it is cooking! 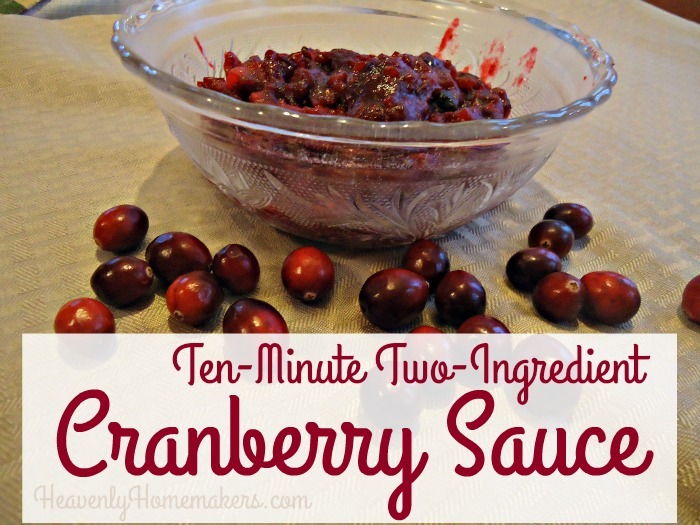 I’ve been making my own cranberry sauce for several years now as it is so easy and a lot healthier for us. But this year we will be going back to the canned version. My 12 yr old daughter surprised me yesterday–she saw some canned cranberries while we were shopping and decided that she wanted to help out with the Thanksgiving dinner. I had no idea she had bought them until after the fact. With her own money at that! The grin on her face was priceless. I’ll enjoy the shloppy sound this year and smile as I think about it. Here’s a recipe with just 3 ingredients and a lot less sugar. No sour faces!! It’s adapted from a Weight Watchers recipe. Mix together in chopper until diced consistency (don’t blend, or you’ll have a thick cranberry juice that is too watery). We make it with 2 clementines and 1 TBSP sugar first, then add more sugar if needed. Enjoy!! This has ALWAYS been the way we’ve eaten cranberries for Christmas and Thanksgiving! However, we’ve always used EQUAL PARTS SUGAR AND WATER in the recipe to make it more “saucy”. Yours looks rather thick. Also, we have canned it in the past using a water bath, but find that we prefer to just freeze extra bags of cranberries to use throughout the year – they seem to keep FOREVER in the freezer. That way, the sauce is always fresh. The canned version cooks much longer, so it loses some of the fresh taste. Since it only takes such a short time to make, why go through all of the mess and work of canning it?! 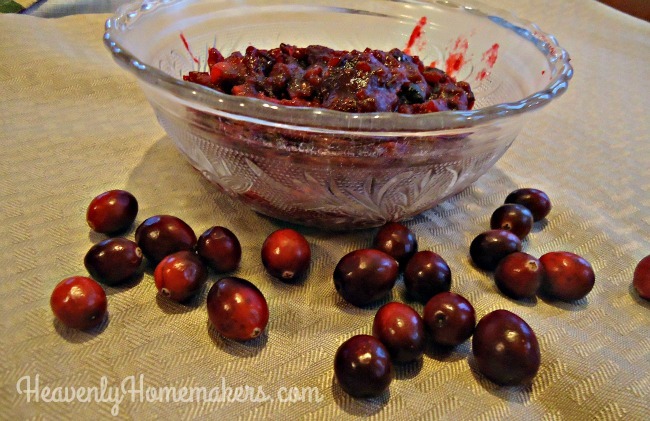 This is really a simple way to make homemade cranberry sauce. Thank you for the recipe I look forward to trying it this year and skipping the canned. Just out of curiosity if you put the ingredients in a crock pot do you think it would come out the same? My family really likes cranberries prepped the way you’ve described…except with several spices added: Cinnamon; clove powder; allspice; nutmeg, etc. This week our Aldi had bags of the national brand for cents = exactly half of what we paid at Walmart last week door the very same thing. I don’t like cranberries except if they’re with some kind of meat or stuffing. Leaves more for all of them! I may have to try those spices next year. That sounds delicious! I LOVE cranberry sauce! And I also make homemade cranberry sauce every year. We only have one other person who eats it at the family gathering – but it’s worth it. I usually make two bags worth and can it like jam to use all year long. This year I added an orange, zest and pulp, to the mix. My recipe is almost the same as yours, just add a cup of water too. Then boil it for 10 minutes and put it in the jelly jars. There are two jars on the counter right now and I am dying to break in and have me some cranberry sauce!